Serves 4. Preparation time 5 minutes. Cooking time 10 minutes. • Pour all the ingredients for the salad dressing into a jar and shake. • Boil the potatoes for about 10 minutes or until tender, drain and cut them in half. • Pour the salad dressing over the potatoes while still warm. 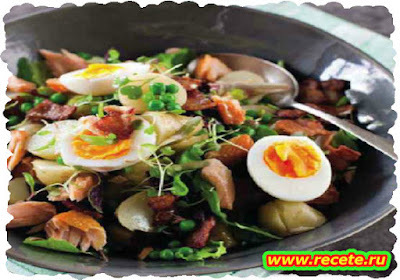 • Fry the strips of bacon in a pan until crisp. • Boil the eggs for 6 minutes, then plunge them in ice water to cool down. Remove the shells and cut the eggs in half. • Put the lettuce in a bowl and put the potatoes and onion rings on top. Add the peas, flaked fish, slices of avocado and halved eggs. Crumble the crispy bacon over the salad.